Johnson Park Elementary (“JP”) sponsored a robotics competition as part of Makers Day Princeton at the Princeton Public Library. Nearly one-third of JP students jumped at the chance to join our first-ever Robotics Team. In the end, 40 of them learned to program a Dash robot and competed for 8 spots to attend our JP Makers Faire Robotics Competition last Saturday. 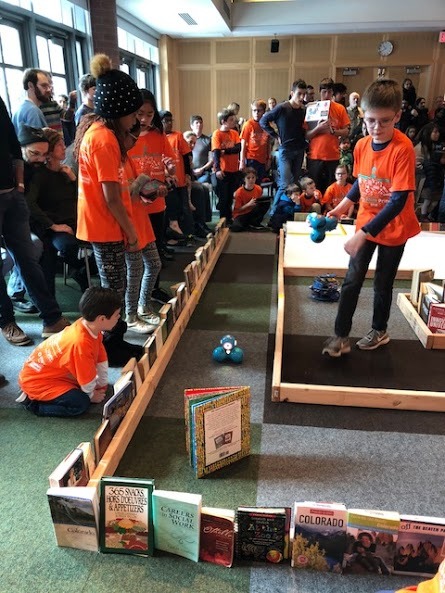 The Community Room at Princeton Public Library was packed with over 100 students and participants ​​​​​​​​​​as our youngsters maneuvered their robot through an obstacle course made of books. In the end, the Princeton High School Robotics team won the big prize, but JP also won. Through this event/fundraiser, our students learned so much and our school has gained a robotics program.